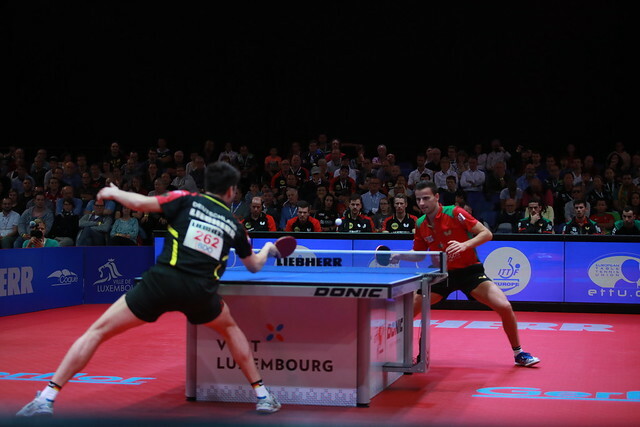 After five days of exciting table tennis action at the d’Coque Arena in Luxembourg the Liebherr 2017 ITTF-European Championships has drawn to a close, and on the evening of Sunday 17th September Germany's long wait to lift the Men's Championship Division trophy finally came to an end following a powerful display against fellow finalists Portugal. The 2013 edition of the tournament had been the most recent occasion on which Germany had triumphed in the category, with the team being restricted to runner up finishes at the 2014 and 2015 competitions to Portugal and Austria respectively. However, the disappointments of its two previous European Championships campaigns just fueled Germany’s determination to succeed at the 2017 event in Luxembourg and, this time around, the top seeds finally returned to the top step of the medals podium. Timo Boll and Marcos Freitas went head-to-head in the standout match of the final as both competitors produced strong performances in a thrilling seven games encounter. Three games into the tie and it was Portugal’s Marcos Freitas who held the advantage, but Timo Boll responded in style emerging victorious in the following two games to earn Germany the first point on the scoreboard (9-11, 11-7, 13-15, 11-5, 12-10). “Marcos and I know each other very well. At the World Championships we also played a very close match, so I spent a lot of time preparing for this match. He is also very intelligent; it is very challenging to play against him and he forces you to play at the highest level all the time”, Timo Boll. In the previous round there was a shock defeat for Dimitrij Ovtcharov, who was suffering from a stomach problem in the match against Slovenia, but there was no such drama for the German player in the final. Facing Tiago Apolonia in what was expected to be a tough encounter, Dimitrij Ovtcharov demonstrated some of his best table tennis to defeat the Portuguese representative without dropping a game (11-6, 11-7, 11-9) to put Germany 2-0 up in the hunt for the gold medal. Just one more victory was required by the German side to end the four year wait for the title and it was Patrick Franziska who completed the job with a fine effort against João Monteiro. Prior to the final João Monteiro was celebrating a title winning campaign for his wife Daniela Monteiro Dodean and her Romanian teammates in the Women’s Championship Division, but there would be no celebrations for João Monteiro in the Men’s Championship Division final as he lost out to Patrick Franziska in the third fixture (10-12, 11-6, 11-9, 11-5) to hand Germany top spot. “I’m proud of my players because they defeated the Portuguese 3-0… I’m very proud of my team that after four years we can take home the gold medal again”, Jörg Rosskopf.